The AGM of the SEMA Distributor Group was hosted on 18th October 2012 by our Managing Director Simon King at the Metalforming Centre, Birmingham. The day featured presentations on forthcoming revisions to SEMA safety codes for pallet racking and shelving systems. The afternoon featured a lively debate on how the SEMA Distributor Group would come together to raise standards and further demonstrate “clear blue water” between SDG members and those companies who were not members of SEMA. Additionally, on the theme of “we are only as good as our suppliers”, the day featured the announcement of the results for the first SDG Supplier of the Year Awards, for best and most improved suppliers. In first place was Storax, and Redirack and Troax were voted into second and third place respectively. Apex won the most improved supplier award. 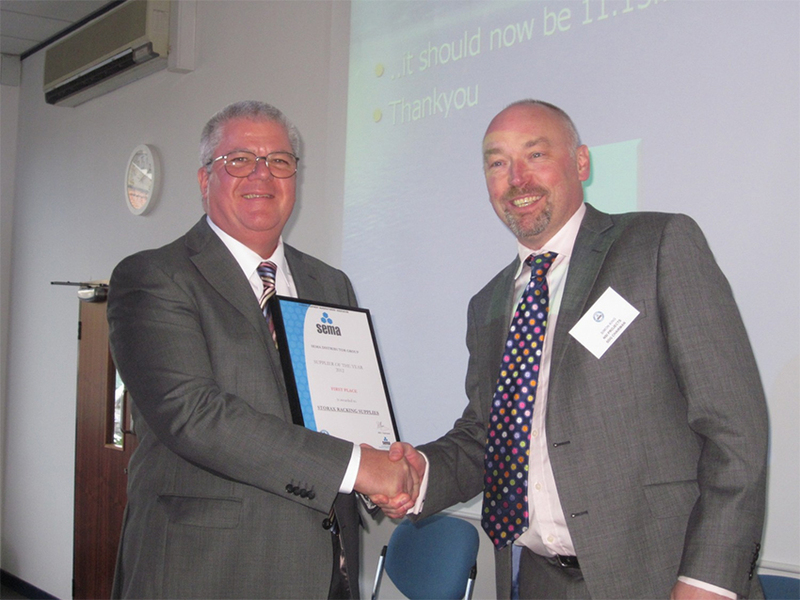 The picture attached shows Simon with the winners Storax, with the award being received by Storax’s Managing Director Ken Powley.